A few weeks ago, I spent half an hour at the really delightful Devonshire Park Theatre in East Sussex, England, UK photographing the view from a number of seats in the auditorium. 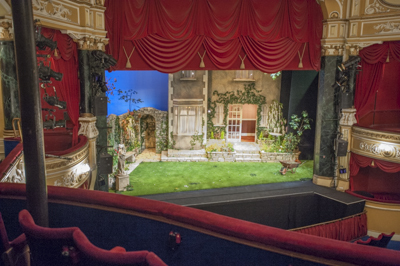 They wanted to show that some of the seats had a less than perfect view so that theatre visitors were not presented with a nasty surprise when they arrived. Nothing too taxing here, but the play that was being presented was "in rehearsal" so finding a time when the stage would be clear, presentable and the auditorium empty was a bit tricky. In fact I ended going back on another occasion as there was a temporary sound mixing desk set up right in the middle of the theatre on my first visit, and this meant that we had to try and match the lighting across the two different days too. In fact, getting the level of "house" lighting right in comparison to the amount of light on the stage was the biggest challenge of the job, and I hold my hands up and admit that quite a large adjustment was made in Photoshop to get these images looking as the client wanted them. The client also wanted each picture to show the reality of the view from a normal seated position, so my natural temptation to lean slightly to one side or the other to avoid the occasional pillars had to be curtailed. We considered using a longer focal length lens for seats at the rear of the theatre, and a wider lens for seats up close to the stage, but settled to go for the same length lens for all the images so that each view could be compared fairly to the others. Only for the seats right up close to the stage did I give the clients a choice of views, and indeed, if you look on the website (link below) you can see that the picture taken from the very front and middle of the stalls is quite a wide angle view compared to the other images in the set. An interesting little job, that at first sight seemed like it would be completely straight forward, but in reality proved that every job will throw up a complication or two. See the results on the new Eastbourne Theatres Website here: Devonshire Park Theatre Seating Plan Photos.